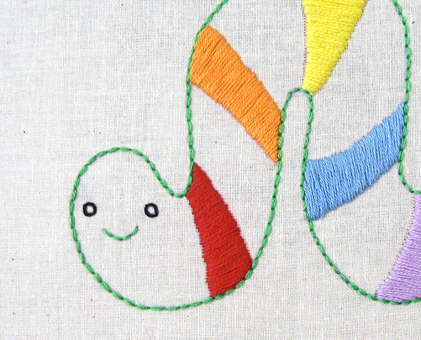 This cute little Inchworm would be adorable stitched onto a onesie or a baby quilt. This 4 page PDF file includes an image of the finished embroidered pattern, a stitch and color guide, simple embroidery instructions, an easy to trace black and white pattern, and a black and white pattern in reverse for an iron on transfer pencil. This pattern measures 4.25 inches x 4.5 inches (approximately 11cm x 11.5cm), but you can enlarge or shrink the pattern to whatever size you like. After checking out, you will receive an email that contains a link to download the pattern to your desktop or downloads folder. SIGN UP FOR OUR NEWSLETTER AND GET A FREE EMBROIDERY PATTERN PDF DOWNLOAD. YAY! Penguin and Fish Blog, Like us on Facebook!Follow us on TwitterPin us on PinterestCheck out our Flickr!